This is a fun, fast quilt to make and a GREAT quilt for a beginner. 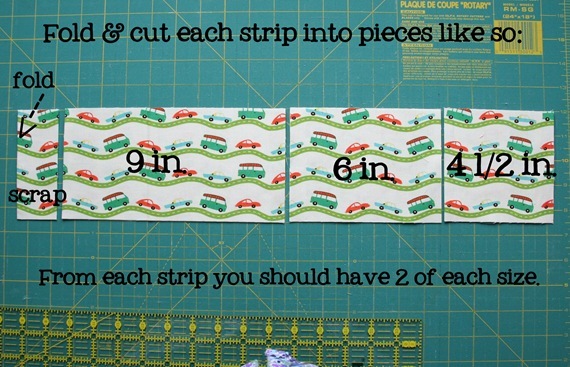 You only need to buy 10 different 1/8 yard strips and the cutting and sewing is easy since there are no matching seams or squaring up edges to worry about. This finished quilt measures 36″ x 40″, but to add more rows just cut one extra 1/8 yard per extra row you want. On to the tutorial…. Once you get the rows laid out and the darks and light fabrics evenly spaced, sew the blocks together into rows, press, and sew your rows together and press. You should now have yourself a cute little quilt top in no time at all! 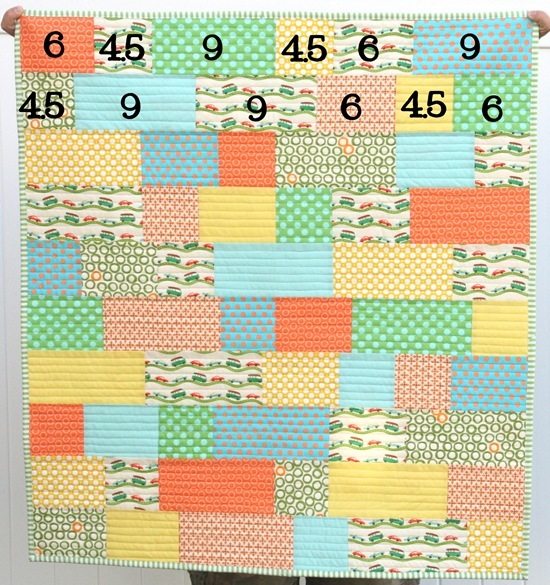 I thought this one would be a good play mat quilt for a boy….to make it a crib size just add two more rows (cut 2 extra 1/8 yard pieces…so 12 instead of 10). 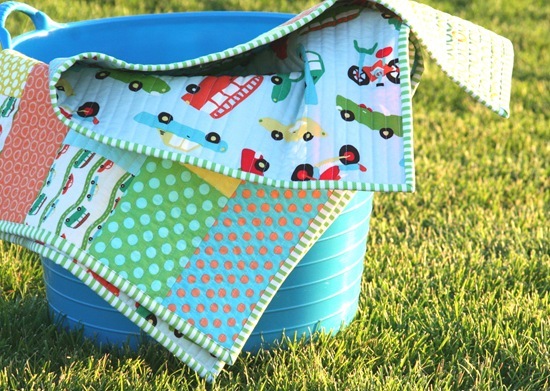 The fabrics used in this quilt are from the Wheels collection by Riley Blake. You can find it here or here. here. I’ve had lots of questions about the polka dots….the yellow dot and the blue and orange dot I have no idea. The orange on orange dot is from the wheels collection, the green and blue polka dot is Anna Marie Horner from the garden party line, the green outlined dots with some yellow dots thrown in is from the Mingle line by Robert Kaufman. The orange print that is kind of leafy with the brown dot in the middle is a Riley Blake print. Any of the others I have no idea but they are probably old! Great tutorial Allison! I'd like to share a link on sewwhattoday.blogspot.com on July 16! I love the simplicity of this quilt. Thanks so much for sharing. Also, love the fabric. So adorable. Thanks for posting this – I really love the simplicity with these fabrics. What a fun easy quilt. I will definitely put this on the list of options for a couple of shower gifts coming up this year! Thanks for the tutorial!!! this such a fun tutorial for such a cute little quilt. What a great little quilt! A perfect day project! This is super cute! thanks for sharing! I just finished a quilt for one of my daughters using the orange quilt tutorial. Here's the link if you want to check it out. I am so happy with how it turned out, thanks for sharing the tutorial! Thanks for sharing how to make this quilt, it looks fantastic and I'd love to give it a go……now that I can see what to do! Thanks for sharing this tutorial. Your finished quilt is adorable! That is so great, I have some fat 1/8ths that I am sure I can do that with and I have been looking for the right project for them. 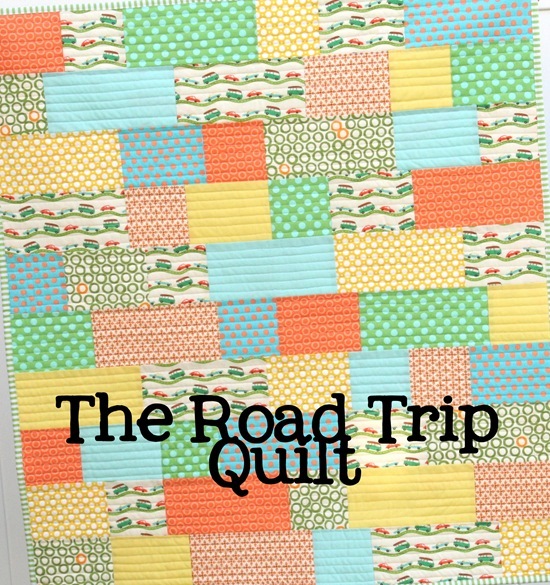 I love these fabrics, I love this quilt, and I love this tutorial! I've never made a quilt before, but I want to try, and I'm thinking that this pattern may very well wind up being my first attempt! How cute is that! I think I will have to use this pattern for the next baby quilt I need to make. Thanks. I went over to Burgundy Buttons excited to order lots of fabric for $3.25/yd! After placing a rather large order I realized it is $3.25 per 1/2 yd. Not per yard. OOPS! You might want to change your referral so that others don't make the same mistake. You've made fabulous use of this fabric. I love your quilt. This is so cute! I'm hoping to go fabric shopping tomorrow and I might have to buy some to make this. I have a baby gift to make and this would be perfect! For true beginner quilters like me, how much fabric should I get for the backing and binding? I'm thinking a yard for the back but probably need some extra for the quilting process so 1 1/4 yards? Would love any input on this. Thanks! Thanks for the tutorial . I knew it was easy to do and it will be great to make one after a difficult quilt. Love it! Can't wait to make it -thanks for sharing! What an adorable quilt! You're so sweet to share it. Love the fabrics you used. And the quilting really looks nice! What a great quilt and pattern! I know the cars are Riley Blake, can I ask what the other fabrics are? using Michael Miller fabric…guitars. Thank you for posting it…its right up my alley! Oh so giftable, I love it! Thanks so much, I'll be linking. So beautiful! Thanks for sharing! Fantastic! but I have the dumbest question ever – when you sew the pieces together are you overlapping them somehow? I have never quilted and don't really understand that step. I also would like to know what other prints you used. Yours is so cute, I want to make sure mine is equally cute. I so love this quilt (and your blog!). Every day starts with a check to see what you've posted. I am having a hard time finding the polka dot fabrics, especially the yellow and the two tone dots. Since I don't have a creative bone in my body, I'm hoping maybe you'll remember which fabrics these are? Thanks again for such a wonderful blog and sharing your awesome talents. 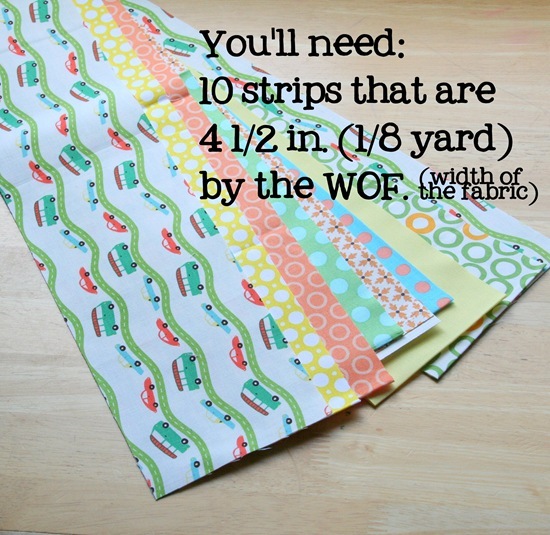 Ok 0 I'm totally going to try this a my first quilt EVER – I found a fat quarter bundle with 6 fabrics in it – can I use that material. I'm so DUMB at this! cute kid quilt. but you're right, quilting in straight lines is SO BORING!! thanks as always for the great ideas and tutorials. This is the first quilt I've ever made, and I love it! Thank you!!! loved this so much that i had to make. just finished making the top of the quilt and i LOVE it! super easy too! thanks allison! I made a queen size Roadtrip quilt as a wedding present. Thanks for the great pattern. It was perfect! Your tutorial is fantastic. I just completed a quilt top using your tutorial and it went so quickly. Love your blog too! I have always wanted to quilt but just didn't know how to start. 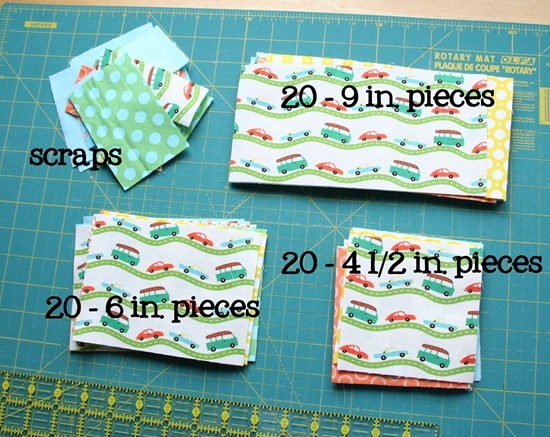 This tutorial is awesome and I am out the door heading for the fabric store. Thanks so much for the inspiration and the tutorial. Thanks for sharing this awesome tutorial. I can't wait to get started on this. Hope it's OK that I pinned it! Wanted to share with my friends. Thanks so much for the tutorial! I've made two boy quilts using the tutorial this year. I blogged the first one here. Thank you so much for the great tutorials and patterns! I really appreciate Crafters who offer their ideas, work and expertise, for free! I love this quilt. I love the movement the little automobiles and "roads" give the quilt. Great placement! And no, I am not a quilter – yet. Just a fabric and supply gatherer – waiting for inspiration – and you just gave it to me. Thanks. What would I need to do to make it twin size? I've never made a quilt before but want to make one for my toddler boy. For a twin I think you could double the measuremts. I want to do a queen size with the Hawaiian prints I have so I think I have to quadruple the amount. Thank you so much for a great tutorial. I just made my first quilt with this: http://www.chriskiki.com/2012/11/the-quilt-that-made-me-cry.html. Thank you oh so very much! Thank you. I donate quilts to the NICU unit and this is the perfect size for an incubator. Hey, I just finished my first quilt EVER for my soon-to-be son. Thanks so much for the tutorial! I actually did 14 rows but otherwise followed your instructions and I'm really happy with the way it turned out! Thanks so much! Great tutorial! It was perfectly easy for my first quilt. A friend of mine (an avid, self-taught quilter) helped me make this quilt as my first quilt ever. It was SO much fun, pretty easy and I love the end result. It's a gift for a friend and her new baby, but my kids are all begging me to make each of them a quilt too. Thanks for inspiring me. I'm getting ready to make another one for another friend and her new baby. Then I'll venture off an make some bigger ones for my bigger kids. Today I'll head to Joann's to buy my own cutting mat and rotary cutter…I'm so excited. Thank you!!! Just found your site and love it. I think I will purchase 9″ of each fabric and cut them in half. Then I will cut into squares and rectangles as instructed. I will then give my 7 yr old granddaughter a flannel sheet to arrange hers on while I do mine. It will be interesting to see how the same materials make 2 different quilts when done by different people. She has made a quilt alreadyand the top for the second one. We have already tagged another one of your quilts to do so will have to get started soon on one of them because we have three months until the next baby arrives.